Spoon 1/3 cup rice onto centre of each of 4 large sheets heavy-duty foil. Fold up all sides of foil to form rim. Pour 1/4 cup water over each mound of rice. 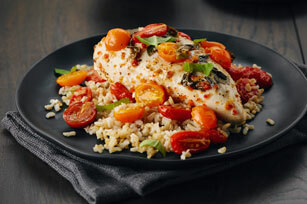 Top with chicken, tomatoes and basil; drizzle with dressing. Fold foil to make 4 packets; place in single layer on rimmed baking sheet. Sprinkle lightly with additional chopped fresh basil before serving. Cut slits in foil with sharp knife to release steam before opening packets.